Technically, these little fellas aren't really wearing their game faces. In googling "game face" I learned that a game face is akin to a "poker face", emotionless. In my ignorance, I thought a game face was a mean, intimidating face, but even then I couldn't stop myself from making some cute, smiley faces on these football cookies. For you sticklers out there, please forgive me. Even so, I claim a play on words since they are going to be a part of the big game. Elizabeth, of Lizy B, made these awesome stadium cookies last year and I knew there would be some in my future. She is a fabulous cookier, and visiting her site is always a treat! For another stadium goodie, take a look at this amazing Super Bowl Sundae from Katrina of In Katrina's Kitchen. She always has something sweeeet to share on her blog! I had a lot of fun making these football themed cookies and I'm sure you will too! The stands of people are made by pouring sprinkles over white royal icing, while it is wet. Then the green royal icing is added. When it's completely dry, the white stripes and numbers are added. Outline and fill the footballs with brown royal icing. When dry, add football details and the facial features in white and black. These are so adorable, I just love them!!! These crack me up! So much better than the other football cookie's I've seen. I am in love with these guys!!! And using the lacing for the mouth?! SO clever! These are SOOOOO adorable! Excellent job! I LOVE these, Sue! So freakin' cute!! Aww I just saw the link love :) xoxo my friend! These are fantastic! Great job Sue..love them! Beyond adorable! These cookies are the *NEW* game face. I love the one that looks serious and mean... hehehe. Football players look like that all the time! Love the cookies! what a great job! i. love. everything. you. make! OMG these are adorable. Those stadiums? PERFECT! 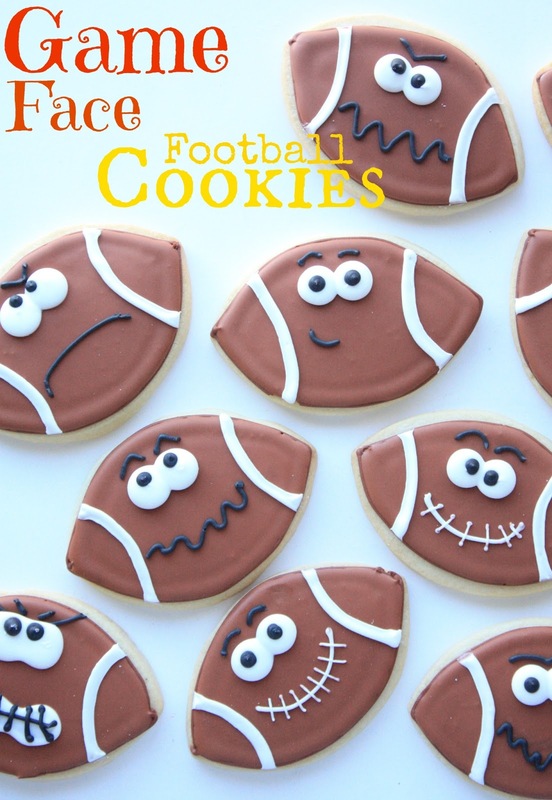 Sue - these football cookies are super bowl SUPER! Cute as can be. How clever. We are having a Super Bowl Party all week. I'd love it if you would bring these over and grab a button. We have some great give aways too. Game faces or not, they are so much fun. Using the football laces as a smile is pure genius. Normally I don't think of footballs as cute ... these are the cutest footballs I've ever seen! Leave it to you to make even a football adorable! LOVE these! The stadium cookies are sheer genius! These are awesome Sue! Go Niners! These are too stinkin cute for all football fans all season long! Cute! I'm going to make these- We just made Valentines Cookies last week- Football cookies this week! Woo Hoo! oh wow, these are ADORABLE! i would love to be able to decorate cookies like this! I think it's been a while since I've popped over, but I love your new design! So pretty!!! These football cookies are AWESOME. I love, love the faces in the footballs and the "people" in the stadium! Pure genius! Thanks for linking up Sue! you know how much I love these! These look delicious! They must also be very flavorful. Very creative decoration! These cooks are so stinkin' cute!! You did an awesome job!! These cookies are so cute. These footballs are really good with their expressions!... with some real tough ones too. Sue, these football cookies are SO perfectly adorable! I LOVE the fields with the colorful crowd of nonpareils sprinkles :) and I love that each face is unique and personalized! You're the queen of gorgeous, creative cookies! Ok! These are my new favorite football cookies! I LOVE THEM!!!! 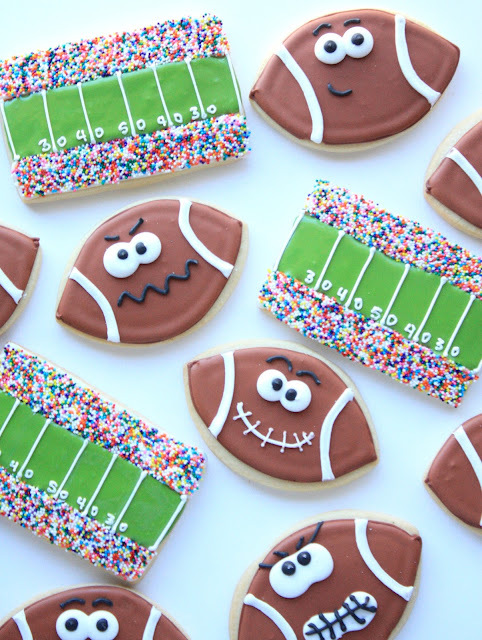 I'm not a football fan by any stretch of the imagination, but these cookies are just so cute, I make have to make some! These are the cutest things I have ever seen! they are PERFECT for a Superbowl party- but CERTAINLY I can not make them myself! I can ...however...give them to a friend who I think could pull it off! Thank you for sharing. These look so adorable, I would like to share them with my friends in my blog. Thank you for sharing with us. These are the best football cookies I have seen yet. I just love them. I am the Social Media Specialist for Michaels Stores responsible for Pinterest and saw your Game Face and Stadium Cookies on Pinterest. We love it would like your permission to pin to our Pinterest board. We only pin with permission from the original source and pin from that source so our pins link correctly. We believe in giving credit to content originators. In addition, with your permission, we would love to follow your blog and pin to our boards content that we feel would appeal to our over 505K and growing Pinterest followers. We’d also like the option to feature pinned content to our blog, The Glue String, again giving credit to the source. If your project is one of our top repins, we would also like permission to feature it in our highlight posts on Facebook, Twitter and Google+, tagging you on those platforms. Could you please provide your social handles so we can tag correctly?